Discuss your round seven moves in My Team. 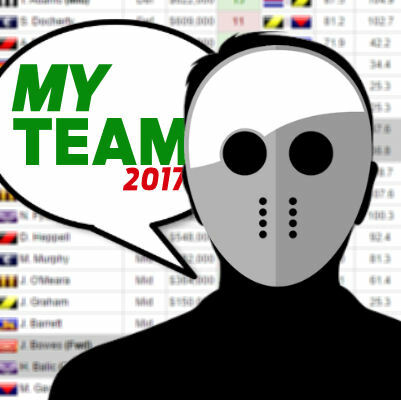 Get involved in the DT Talk community to discuss trades, captains and everything to do with your team in My Team! Beams and Preuss to Merrett and Soldo $245 left. Anyone think Neale- bullen can get his be of 91? I heard he didn’t get as much midfield time with Lewis back, first 2 games he had 110,60 with Lewis in the side, is he with the punt or just move him on? I’m keeping ANB over Rough if he makes the final cut. If not ANB is the one who goes. 1.) Preuss to Soldo and Beams to Merrett, leaving $72k. 2.) Roughead (via Nank) to Grundy and Beams to Myers, leaving $189k. Or any other options cheers. Hey lads, current side is looking like this. Rookies are a mess but have to make do with it. Will ANB even make the team ? what are peoples thoughts. At this stage my trades are looking. Any other trade suggestions are much appreciated. Will hold Watson for the week as he won’t loose cash. Jacobs leaves me with extra cash and he is the sole ruckman of the team unlike Grundy atm with Cox, but we all know how good Grundy can be. Grundy. At least he’s a chance to go low 100s for the remainder of the year with Cox, and push 110 without him. Jacobs is only good for low 90s I think. Have the luxury of benching beams for next week. Is he a keeper or bump up another premo. Beams is out for 2 weeks MINIMUM. Gotta go before Watson! Plus he has more cash on him. Option 2 with any of those Premo’s. What is the point getting Soldo for 1 week. What trades do I do ?? Nank has round 12 Bye which is good. 1. Nank has more money to make and it leaves you a swag of cash. Field Myers or Powell Pepper? Downgrading one of Caddy/ANB to Myers and then upgrading Spencer to Martin leaving me with $196k. Thoughts?? Hey guys got nank and beams and 66k. Atm i’ve gone nank for jacobs and am contemplating either steele or yeo for beams, run barrett in my forward line. Then next week I cash in powell pepper and upgrade a forward to zach merrett by swapping him with yeo next week. Should I go steele or yeo? can you do nank for grundy and watson/beams for sloane? …Which allows for Pruess to be cashed in and an upgrade made elsewhere with Nankervis then returning next week to increase in value and potentially be a keeper for several more weeks considering Grundy isnt a huge improvement. the 200k banked from Preuss can upgrade Beams to Sloane/Merret/Rocky etc, as opposed to getting in Grundy and downgrading elsewhere. How else do you plan on cashing in Pruess? To a non playing Ruck later in the year? why not cash him in for someone who provides future cover should Nankervis miss a game. Completely disagree with your comment Chad. Might not suit everyone but still a reasonable option. 100% Agredd Thrice, couldn’t have said it any better. Rocky and a red light or jack Steven and Ivan soldo ? ?